Worktops are one of the most important aspects to the look and feel of your beautiful kitchen. As one of the most expensive features, it’s vital to make the right decision for your kitchen. 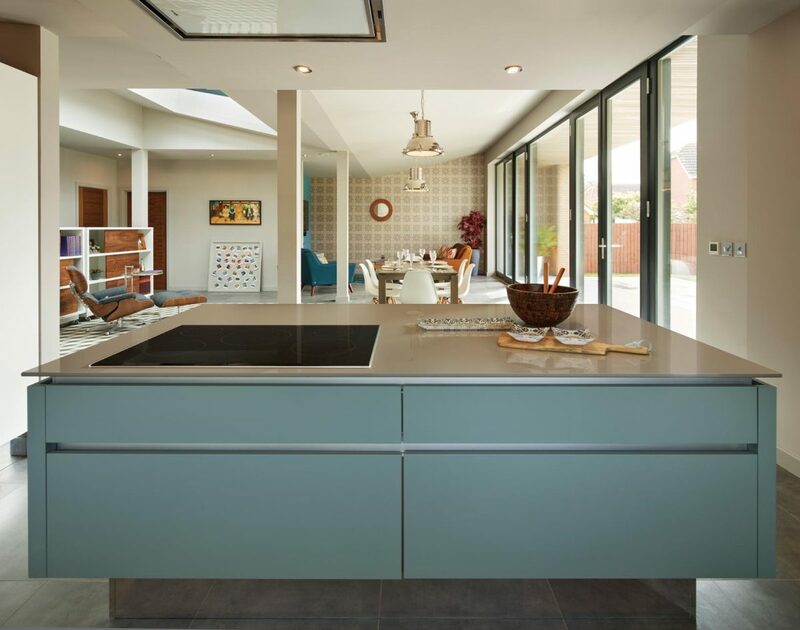 In this in-depth guide we’ll go through all of the main worktop options and look at the key benefits, design uses and the level of maintenance required. Laminate worktops are by far the most popular type of worktop. This is largely because they are hardwearing and there are so many styles available, but the fact they’re also the cheapest worktop type might have something to do with it. Moreover, these worktops are extremely low maintenance: apart from keeping them clean there is nothing else that you need to do. It is very resistant to scratches, is heat resistant up to 180°C and does not stain easily. Laminate worktops are great for the accident-prone among us. However, unlike wood which can be oiled to remove stains or glass which can polish out scratches, your laminate worktop will need to be replaced if you do manage to damage it. You will often see laminate worktops in low budget kitchens, but if the right style is matched with the kitchen design then it can look incredible. They can save you hundreds or even thousands on your kitchen cost compared to some of the other worktops. 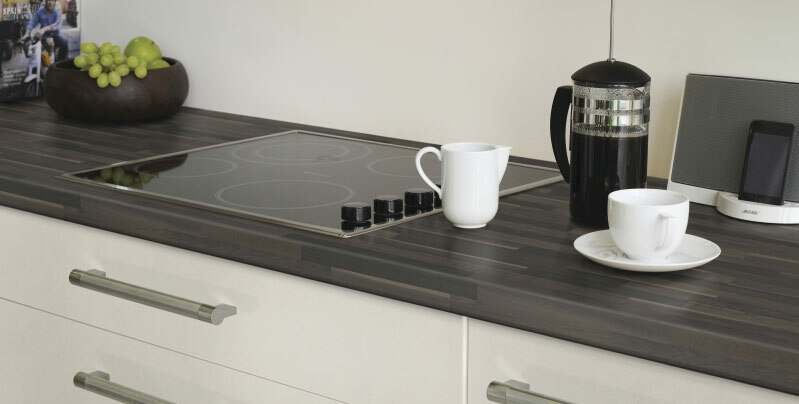 We supply 30 styles of laminate worktop, ranging from granite effect to plain matt white. Regardless of your kitchen style we can help you find the perfect laminate worktops to compliment it. If you’re going for a traditional or rustic feel to your kitchen then you will undoubtedly consider wooden worktops. Interestingly, they are increasingly being used in contemporary kitchen designs because they can give a natural, warm and homely feel to the kitchen – something that a lot of modern kitchen designs can lack. Wood changes colour with age or you can change the colour yourself by applying different oils, which is perfect if you want to give your kitchen a facelift every few years. 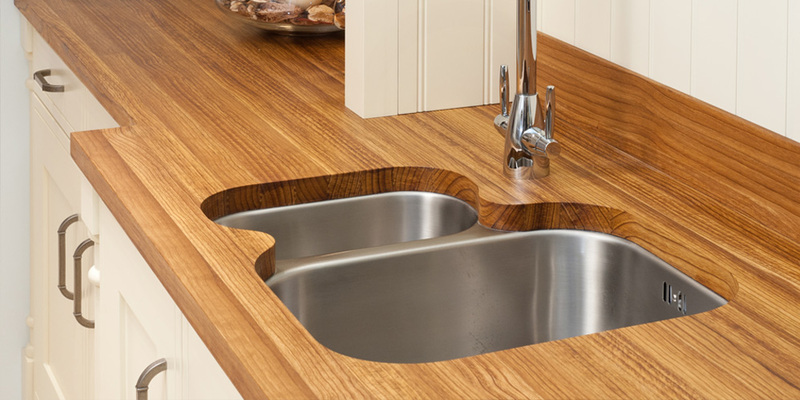 Plus, wood looks great with an under hanging sink and can be cut into any shape, so will go with almost any kitchen design. We would advise that wooden worktops are fitted by a trained professional carpenter/kitchen fitter, but you can fit it yourself. If you do, you need to make sure that you leave 30mm gap between the wood and any heat source, and leave 4-5 mm gap where the worktop meets the back wall. Wood is a natural product that is affected by humidity and heat, it expands and contracts throughout the year depending on the season. Wooden worktops are rather high maintenance compared to other worktops, but this is an all natural product, so it makes sense. In order to keep your worktop looking pristine and new you’ll need to oil it regularly; how regularly depends on how much it is used, but we would recommend at least once every 6 months. Applying oil will keep it water resistant, hygenic and stop any unsightly stains or watermarks from forming. The type of oil needed will depend entirely on which wooden worktop you choose, but we’ll advise you of the best type when you purchase. Regardless of how much you oil the wooden worktop you’ll need to keep your eyes peeled for standing liquids; the oil is not waterproof. If you leave liquids to stand on your worktop for too long you’ll get water stains, or even worse – rotting. Also, do not place anything too hot (e.g hot cooking saucepan) on the surface: it will leave a burn mark. Instead you should use trivets to place pans on, or a tea towel for the lazy among us. However, one great thing about wood is that it can be sanded down to remove most unsightly stains or marks, but prevention is better than cure! Wooden worktops which have been oiled regularly are hygienic, but you should avoid chopping food directly on the surface. Cuts to the surface can lead to areas for the bacteria to hide, which will make food preparation potentially unsafe. It is important to also regularly clean the worktop with washing-up liquid to ensure that the surface stays bacteria free. It is fair to say that wood is a high maintenance worktop material, but it will give you a natural and warm look and feel to your kitchen that simply cannot be matched by any of the other worktops. Glass worktops work really well when you’re going for that super slick contemporary kitchen look. They can be manufactured in almost any colour and can make your kitchen feel lighter with their reflective surface. More and more people are choosing glass because they realise how strong and easy to maintain it is. Plus, these worktops can also be lit from below to give your kitchen a truly unique look that will leave guests in envy of your kitchen. These glass worktops are not your ordinary window pane glass: they are crafted from toughened glass which is highly durable and resistant to most of what your cooking can throw at it. However, if you’re vigorously chopping with an extremely sharp knife then you can still scratch this glass; but the scratches can be polished right out. If you make any chips in the surface then just call your local windscreen repair company… – seriously, that will work. These worktops do not need any maintenance and the best way to clean them is with plain old vinegar and newspaper, this ensures you do not leave streaks and avoids chemicals mixing with foods. The only downside to these worktops is that they can show up fingerprints easily, particularly with darker colours, so you’ll need to be constantly armed with your polish cloth. Glass worktops are still relatively new, but they’re quickly gaining a reputation for their low maintenance and ‘wow factor’ appeal. They can be manufactured to fit your kitchen exactly and in almost any colour you choose. Expect to see a lot more glass worktops around over the next few years. Granite is one of those materials that never seems to go out of fashion. It’s natural feel, toughness and unique patterns are part of its enduring appeal. As the most expensive worktop on the market, granite is a luxury product that offers an unrivaled finish. Granite worktops can suit both traditional and modern kitchen styles. Granite worktops are very low maintenance, but extremely tough and hardwearing. When the worktop is first installed you will need to seal it, but then nothing needs to be done for the next 10 years. You do need to be careful with citrus, wine and acidic foods or liquids: these should be mopped up straight away to avoid leaving a mark that is impossible to remove. Any general cleaning just needs to be done with a damp cloth and mild detergent. Granite surfaces will look like new until you decide it’s time to replace your kitchen; they do not get affected by the sun and do not stain. You will need a professional fitting company to fit these worktops because they are so heavy and need to be cut using specialist machines. Plus, you need to make sure your cabinets have been correctly fitted and use high quality units to support the weight of this heavy worktop. These worktops look fantastic when you have large areas of surface counter and are a true statement of design and luxury. They are a real investment in your kitchen that will not only keep your kitchen looking fresh for many years, but its natural colour, character and beauty will really make your kitchen design stand out. Otherwise known as engineered worktops, quartz is an incredible material that can give you the granite worktop look and feel, but without the high price tag. Because quartz is not a 100% natural product it means that it is manufactured in a wide range of colours and patterns, so you can find the right one to suit your kitchen design. These worktops are made by combining 90% ground quartz (a natural hard mineral) with 8-10% resins, polymers, and pigments, this forms a very, very hard surface. The various styles are made from using either finely ground quartz to produce a smooth look, or coarsely ground Quartz to produce a flecked appearance. For the environmentally conscious among us: you’ll be happy to know that quartz is the second most abundant material on earth. Quartz is extremely hard wearing and will not fade over time. Unlike granite, quartz is not susceptible to marks left from citrus substances or wine. The only maintenance required is wiping off dirt with a damp cloth. However, the weakness of quartz is heat, it has a limit of 160°C. This means that you cannot take items straight off of the hob and place them directly on the surface, you will need to use a trivet. If you forget you’ll soon find that your worktop has cracks or burn marks. Similarly to granite, quartz is very heavy and will need to be installed by professionals. You’ll also need to ensure your cabinets are capable of withstanding the heavy weight. Although you can’t achieve the exact natural look and feel of granite, quartz has many other advantages which make it even better in many respects. With so many colours and patterns to choose from, you’ll be guaranteed to find one which suits your kitchen design perfectly. Stainless steel worktops have been popular for many years in commercial kitchens, but over the past few years they have rapidly increased in popularity for domestic kitchens. However, this is not just a design trend, there are some really good benefits that are worth looking at. These worktops are perfect if you’re trying to go for the minimalist, contemporary or commercial kitchen look and feel. They work great with stainless steel cabinets and splashbacks or with basic units. You will need to have them fitted professionally because they are often made to measure. Stainless steel is a very hard wearing surface; it can deal with heat up to an incredible 1400°C! But it is not indestructible: it does scratch easily and can dent. However, many who go for stainless steel would argue that the worktop gains character, kind of like showing a history of your cooking over time. It is used in the commercial kitchens so much because they are perfect for preparing safe food, so for your own kitchen this is certainly a hygienic solution. It is a low maintenance worktop that only needs to be wiped down after use. Because this is a metal surface you’re not particularly limited on what cleaning chemicals you can use, but it does not require harsh chemicals to maintain the shine. Stainless steel also resists corrosion really well, so will last for many years and still look great. We accept that stainless steel worktops are not for everyone, but for those that want a very contemporary or minimalist style they’re perfect. There is one more worktop that you should definitely be aware of: Dekton. You’ll notice that all of the worktops we’ve mentioned above are hard wearing up to a point, but Dekton is looking more and more like the miracle worktop that us kitchen designers have been looking for. You can read all about Dekton in our recent blog. There are many more worktop types (copper, corian, marble and concrete to name a few), but here we have covered the main ones. Ultimately, it depends on your budget, kitchen style and lifestyle as to which worktop will be best for your kitchen. You need to make sure that you think about the amount of maintenance required in it’s upkeep and what design look you’re trying to achieve. Your worktops can easily be the most expensive item in your kitchen so it pays to make sure you choose the right ones. It is important that you talk through your worktop preference with a professional kitchen designer: we know the industry and can recommend options that you might not have considered. Sometimes this might be new worktops that have only just come onto the market, so it is worth taking the time to discuss with us first. Get in touch with Jane on 01279 504230 or email info@designerkitchensforless.co.uk to talk through your worktop options.